Is there anything beyond Pluto? Yes. Thousands of small objects orbit the Sun beyond Pluto. 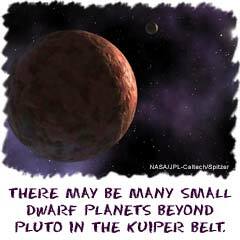 Most are found in an area called the Kuiper Belt. You will find asteroids, comets, dwarf planets, and other small solar system bodies. The objects you find out there are also called Trans-Neptunians (beyond Neptune). Astronomers have only begun to examine the area since 1992. It takes special probes and telescopes to study the area. The Kuiper Belt is like the asteroid belt in some ways. A very large area looks like a flattened doughnut. The shape is also called a toroid. Astronomers believe the area holds pieces that have remained the same since the beginning of the Solar System. You start to encounter objects in the Kuiper Belt at about 50 times the distance from the Earth to the Sun. The edge of the Solar System is about 100 times the distance from the Earth to the Sun. As we said, there are many asteroids found in the Kuiper Belt. Many of them have diameters more than 50 miles across. Astronomers also believe that many short-period comets begin their lives in the belt. An example of a short-period comet is Halley's Comet with a period of 76 years. Short-period comets make a complete elliptical orbit in less than 200 years. Comets that take longer to complete a trip around the Sun are called long-period and are usually found in the Oort Cloud. As time passes, astronomers will learn more about the objects in the Kuiper Belt. They currently have records of over 70,000 objects (mainly asteroids). Because they are so far away, they are very difficult to study. Imagine trying to look at a black rock (in black space) that is only 50 miles across from about 46.5 billion miles away. That's what scientists have to deal with. In January 2006, the New Horizons mission was launched to study Pluto and objects in the Kuiper Belt. The spacecraft should reach Pluto in 2015 and then continue through the belt in 2016. There are many discoveries to be made in the farthest reaches of our Solar System.